Avast, ye landlubbers! Join our swashbuckling crew of scallywags for one of our thrilling pirate adventures aboard our authentic replica pirate schooner. The Marigalante looks just like an eighteenth century galleon. Adults and kiddies alike will feel as though they have travelled back in time to an era when buccaneers sailed the seven seas searching for cargo vessels loaded with Spanish gold. 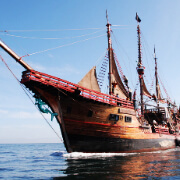 You won’t simply be a passive observer on our pirate-themed excursions on Banderas Bay; our crewmembers will recruit you to assist with the operation of the vessel as you sail from the port of Puerto Vallarta to a splendid beach hideaway. Our staff of knaves will also involve passengers in fun-filled games and silly contests. You will feel as though you are in the middle of a big budget Hollywood production as an elaborate stunt-filled battle breaks out on deck. The performances of our acrobatic crew members are sure to delight and entertain everyone on board. But the fun doesn’t end on deck; you’ll be transported to a fun coastal locale on Banderas Bay to enjoy even more activities, including snorkeling, kayaking, and even more games and entertainment on a pristine beach. You can also choose to enjoy a family-friendly dinner cruise on the amazing waters of Banderas Bay as the sun slowly sets over the Pacific horizon. The prismatic colors of the western sky will create a memorable atmosphere on your family outing while vacationing in Puerto Vallarta. 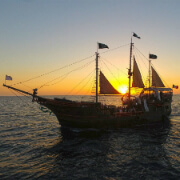 Join our swashbuckling captain aboard our authentic replica pirate ship for a thrilling maritime adventure to the aquatic playground of Pirate Land, a destination on Banderas Bay where you can enjoy a plethora of fun activities including snorkeling, kayaking, beach games, and banana boat rides. 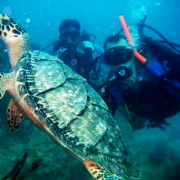 Call 888-558-3330 now for help finding Things to do in Puerto Vallarta. Sail into the splendor of Banderas Bay to the south of Marina Vallarta on the beautiful sixty-eight foot sailing craft, the Elias Mann. Your destination on this excursion will be the towering rocky isles of Los Arcos, where you can enjoy a great snorkeling outing with our friendly crew.